Abstract: With CAD/CAM work you damn well don't want the computer to be the limiting factor in productivity. Corporations have always been a conservative bunch, slow to embrace new suppliers in the face of Intel's overwhelming 'warm fuzzy feeling'. Intel is in a way like a security blanket - the IT department grew up on it, and they know it backwards and forwards. Any impetuous to move to a different platform is only going to be brought about by major performance increases and major cost reductions. Fortunately for AMD, the Athlon XP2000+ fits into both of these categories with ease. As we learned over a cup of coffee with the nice AMD folk at COMDEX last year, AMD processors are still struggling with the large business segment that tends to think 'Intel Only'. With 27.5% market share of medium sized businesses and 39.8% in small businesses, the 6.7% stake that AMD has in large corporations is just a drop in the bucket. Given the performance numbers we have been seeing with the Athlon XP 2000+ compared to the Intel Pentium 4 2.0GHz, its not surprising to see more and more individuals and IT guys siding with the Athlon for workstation systems. Now naturally there are different levels of workstations, culminating with a dually for the real die-hards, but even a single processor system can offer employees a solid computing foundation. After all, if you're paying someone $80 and hour to do CAD/CAM work (AutoCAD or Microstation SE for example) you damn well don't want the computer to be the limiting factor in their productivity. Performance and stability then become the key points. With that in mind we are going to be looking again at an Athlon XP 2000+ system to see how well it handles in the workstation environment. Obviously this is just a starting point from where you could go with the system we're looking at; upgrading the GeForce3 Ti500 to a Quadro DCC based graphics card, and increasing the DDR to 3GB for just two examples. We looked at this same system previously from a gamers perspective, so there will be some overlap between the two reviews (we're talking about the same gear), so if you've already read the first review I suggest you jump right a head to the benchmarks. Going head to head against the Athlon XP 2000+ will be a Pentium4 2.0GHz - darling of the corporate world. The AthlonXP processor incorporates several new features that it's older brother, the Athlon doesn't have. Most notably is Quanti-Speed Architecture. What exactly is Quanti-Speed you ask? Well, first off it's really more of a marketing ploy then anything else, and essentially says that "our CPU's do more work per clock cycle, so MHz means nothing now." Still, there are some true enhancements from the Athlon core. Probably the biggest enhancement was the inclusion of Intel's SSE technology, the same technology which is inside every Pentium III processor. Streaming SIMD Extensions were also added to allow the Athlon XP processors to handle multiple data calculations at one time. Still, with all this great technology, it's only really useful if the software programmers code for it. Fortunately for AMD, SSE has been around for quite some time now, so there are quite a few pieces of professional software already using it. Not surprisingly AMD chose to call it 3DNow! Professional rather than SSE. Next in the line of additions to the Athlon XP is hardware prefetch, which is built into the "Palomino" core (AthlonXP and AthlonMP). What hardware prefetch does is look at what the user is doing and try to extrapolate what piece of data is going to be used next. The processor stores that prefetched data in the L1 data cache, thereby increasing the speed of calculations when that data is needed. If it turns out to be wrong, it will simply flush the cache and get the data that's actually required. Almost each and every company that manufactures processors has been trying to find ways of educating the consumer about the dangers of relying entirely upon the "MHz Myth." AMD for itself, has started the True Performance Initiative (TPI). What the XP model numbers currently in use are trying to communicate is the relative application performance. The real goal however is base "performance" ratings on IPC (Instructions executed Per Clock cycle) x MHz = TPI. AMD has been working with many larger OEM's such as Compaq, HP and Sony to try and create a appropriate performance rating system. The XP 2000+ system came to us fully configured in a nice mid-tower case with space for a rear exhaust fan, and packing up to four HDD bays (that involves nixing the FDD). 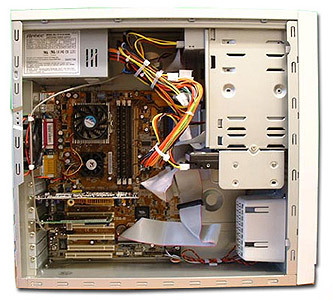 The standard OEM power supply had been replaced with a more powerful 400W Antec to meet the Athlon XP's higher power requirements. 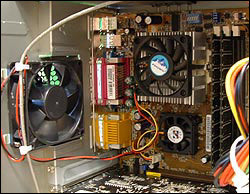 Curiously, a generic FoxConn heatsink was installed on the Athlon XP 2000+ processor. The heatsink (exact model number unknown) made use of a chrome plated copper slug screwed on to the base of the aluminum extrusion in an attempt to boost performance. With the small fan that the heatsink came equipped with, average core temperatures hovered around 50-60 degrees Celsius. Noise however, was not an issue. I would personally suggest replacing this heatsink with something a bit more powerful, perhaps an Arkua, Thermal Integration or Alpha 8045.